Back in the early 1990s when I fished the River Dane on after work sessions with one or two of the staff of the tackle shop the tactic was to bait a few swims in the evening and fish them after dark. 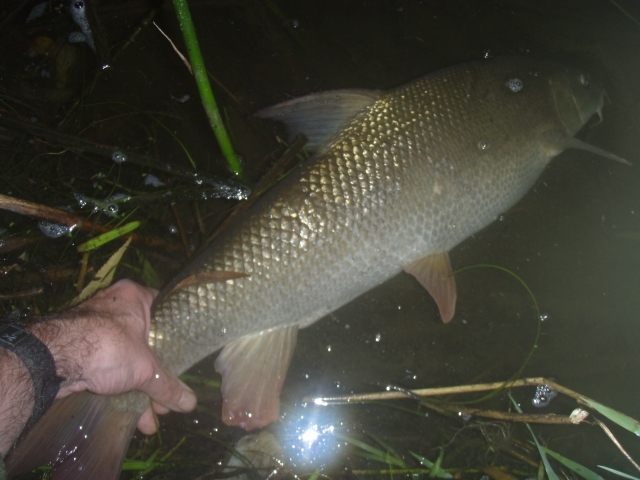 Apart from a few small chub and one small barbel my strongest memory is of fighting with a barbed wire fence that my landing net mesh got caught up in. So badly tangled was it that I ended up removing the arms of the net and leaving it. For all I know it's still there. Despite the less than ecstatic memories of this way of fishing I found a stretch of the Trent that looked good for it. Not least because there was no barbed wire in sight! The plan was to put a few droppers of bait in above and below each overhanging bush, and near any other feature (like marginal rush beds) that appealed. With the bright sunny weather and low, clear water conditions still prevailing now seemed a good time to put the plan into operation. By eight o'clock the baiting was done so I took the tackle I wouldn't be needing back to the car and with the rest of it I then headed for the furthest upstream swim. My initial idea was to give each spot half an hour. The first three produced nothing, save an occasional rod top rattle. Settling into the fourth swim my confidence level rose and I gave it an hour before moving. The fifth swim really did look the part. The bush had a large fallen branch wedged in it providing and additional haven for fish, there was a small back eddy and immediately downstream a length of rush growth started with a reasonable depth in front of it. I'd give this spot longer. I'd only had a bait out for half an hour when the rod top jagged sharply down twice before slamming right over. As the barbel had headed downstream and out away from the snags there was no need for strong arm tactics and I could enjoy the fight. It was another arm-acher, and when I laid the fish out on the bank I was sure it was a double. A really solid, muscular, golden scaled fish. The scales tried to convince me it was a nine and a half. I wasn't expecting any more action for a while after that scrap in the shallow water, and with me tramping up and down the bank so close to where my bait was cast, so when half an hour later I saw the tell tale tap, tap, tapping of a chub on the rod tip I was a bit surprised. 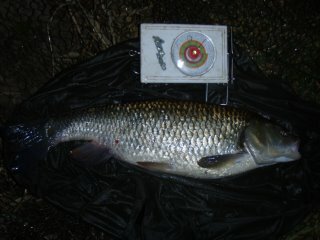 The size of the chub was also a bit of a surprise. It looked every inch a five pounder. This time the scales got it right, unless it was nearer six pounds than they read! After an hour and a half or so in this swim I made my final move of the night. I was starting to get pretty sleepy by now, but the rod pulling right round and springing back woke me up, and on the next cast a couple of chub knocks were struck at and a fish hooked. It didn't feel like a chub, nor did it feel like a barbel, but it was. A small one of a couple of pounds or so. "Time for bed", said Zebeddee. Saturday dawned misty and cool. When I got my head down at 2.30am the car thermometer read 9.5, by dawn it had dropped a further 2 degrees. After a brew I set off to investigate some stretches I hadn't seen before, and it was gone nine, sunny and warm, before I got a bait in the water. Lack of sleep drained my enthusiasm, as did an aching hip which also curtailed my eagerness to walk far with my gear. Even so I fished three swims before having another run round sussing spots out. Time was getting on, a banker swim seemed favourite for my final port of call, and despite a the presence of a couple of cars in the car park the burdock swim was free. Even though I fished well into dark it failed me this time. Definitely time to move on. Although the day had been a blank in terms of fish caught I'd had a good look round and seen a few nice looking spots to try in the future. Not a complete waste of time. The forecast is for the weather to break this week. There might be colour in the rivers in a few days, but I can't see an opportunity to get out and take advantage of it. However, I'll try to make time.